Temporarily closed for restoration works. Defensive structure designed by local architect Giovanni Capula and built by the Pisans in 1305. At the beginning of the fourteenth century, Pisa, in response to the threatening Aragon rise in the Mediterranean Sea, erected impressive towers in order to reinforce its stronghold in the south of Sardinia. Designed by the Sardinian architect Giovanni Capula, the Elephant Tower and the St. Pancras Tower were praised for their uniqueness, and, in 1535, Charles V, the powerful sovereign of the Holy Roman Empire, included them among the best military works of the entire Europe. Finished in 1305, with its walls of thick limestone blocks, its narrow loopholes and its heavy gates, the St. Pancras Tower protected the northern side of Castello; placed a hundred metres above the sea level, built on four levels with a total height of more than thirty-six metres, it was also a perfect lookout station against attacks from both the sea and the hinterland. In the sixteenth century the tower was used as a prison, where convicts lived in inhumane conditions. 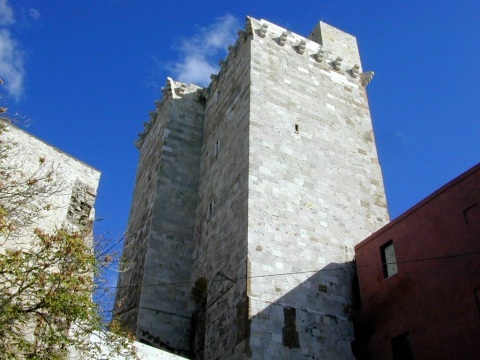 The St.Pancras Tower is one of the most recognisable figures in Cagliari's landscape. Restored to its original appearance, it is now open to visitors with access from the adjacent Palazzo delle Seziate.